After completing an order, you will be directed to a checkout page which displays your shipping information, in addition to a detailed invoice. The scheduled date for delivery will be provided under the invoice dollar total. 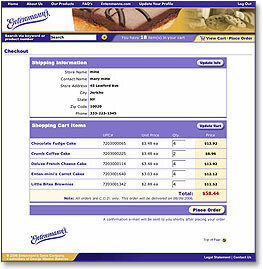 If you are satisfied with the information, click on "Place Order" to submit your order to Entenmann's for processing. Once the order is placed, you will receive an email confirmation sent to the email address provided during registration.